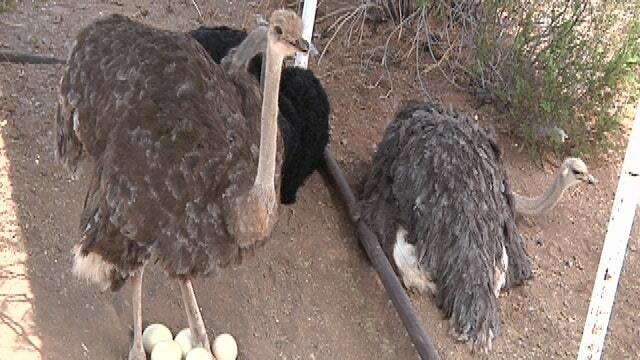 An ostrich ranch in the middle of the Sonoran Desert may seem a little strange to some. But to the Cogburn family, Rooster Cogburn Ostrich Ranch represents a dream. And 11 years ago, this dream was almost destroyed. In 2002, two hot air balloons launched next to the ranch in Picacho, Arizona. The noise spooked the ostriches, causing them to stampede. Over the next year, almost 1,000 ostriches would have to be put down due to their injuries. The family fought the balloonists in court, but ultimately lost the battle. “It just destroyed us and everything we’ve worked for. And unfortunately, the legal system favors insurance companies- not businesses,” said ranch co-owner, Danna Cogburn-Barrett. Many thought the incident would end the business, but the native-Oklahomans refused to walk away from the ranch they worked so hard to build. Instead, they changed course--from farming to entertaining. The family scoured the earth to find exotic replacements for the lost ostriches. Visitors today can interact with miniature donkeys, prairie dogs, goats, deer, ducks, giant turtles and rainbow lorikeets. But the most popular addition to the ranch’s lineup? The monster truck tour. “My folks went all the way down to Florida to find those monsters. We brought ‘em back and dismantled them, so they could ride all around the desert and Picacho Peak. Lots of fun, but they’re actually very educational. They’ve brought in a lot of people. They&apos;ve just become very, very popular,” said Cogburn-Barrett. The ranch’s development into a Southwestern tourism hotspot was not what Danna&apos;s dad, DC ‘Rooster’ Cogburn, envisioned when he moved the ranch to the desert in 1993. But with tragedy comes change. Some might expect the family to be bitter at their loss, but the Cogburns don&apos;t sit back and feel sorry for themselves. “We’ve had to rearrange. Our family does have roots in the entertainment businesses… Now we’re doing our own thing. We’re willing to work hard and do the right thing, and we don’t want our wagon tied to someone who’s not,” said Cogburn-Barrett. Rooster Cogburn is in the process of adding even more to the ranch. The new animals should be revealed later this year.